Hello Mood Sewing Network! I’m so excited to be joining the MSN as an international guest blogger all the way from London in the UK and can’t thank the team at Mood Fabrics enough for having me. 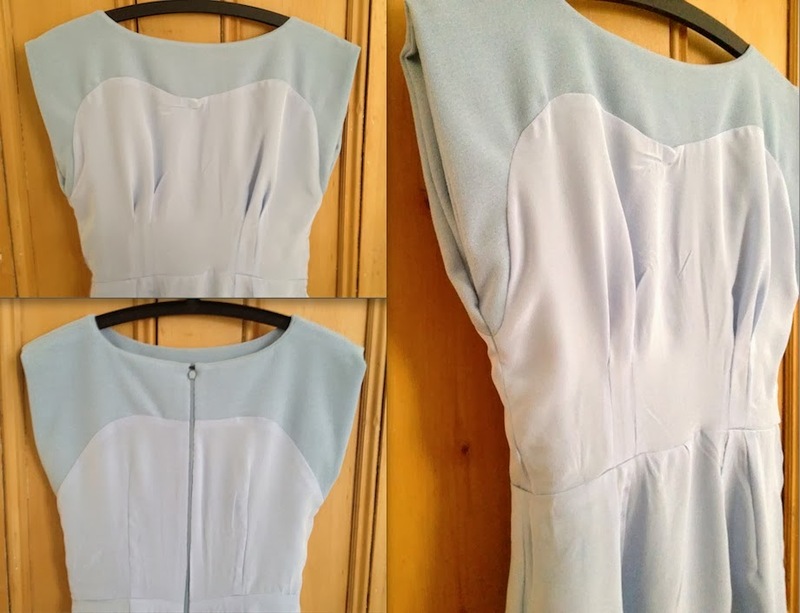 I wanted to challenge myself a little for my first Mood Sewing Network make and I’ve recently been drawn to garments with sheer inserts and panels that are so popular at the moment. So with all these beautiful new fabrics now on offer to me I decided to expand my repertoire and dip my toe into sewing with chiffon. When I say ‘dip my toe’ I mean that fairly literally as I only opted to use it for a wide band around the hem of this dress, but it was the perfect amount for a first go and I have conquered any fear I had of working with it! I spent a fair bit of time looking up tips for working with chiffon and ended up more worried about it than I probably was to start with. However this silk chiffon is surprisingly easy to work with, it presses beautifully, holds the kick pleat at the centre back well and my machine didn’t try to eat it even once! I opted to use the rolled hem foot on my machine, as this widely seemed to be the recommend hemming technique for chiffon, and even this decided to play nicely for once: it might be the best rolled hem I’ve managed yet. To create the chiffon hem I marked the depth I wanted on my skirt pattern piece rather than just cutting a strip, as I wanted to continue the pegged shape of the pencil skirt. I added enough width at the centre back seam to create the box pleat then cut this piece on the fold to avoid extra seams in the chiffon. I then assembled the chiffon panel entirely separately to the skirt (including basting the pleat in place, french seaming the side seams and hemming) and attached it in one to the hem of the skirt. I bound the edge of this seam, pressed it up towards the skirt and slipstitched it down as you would with a normal hem. 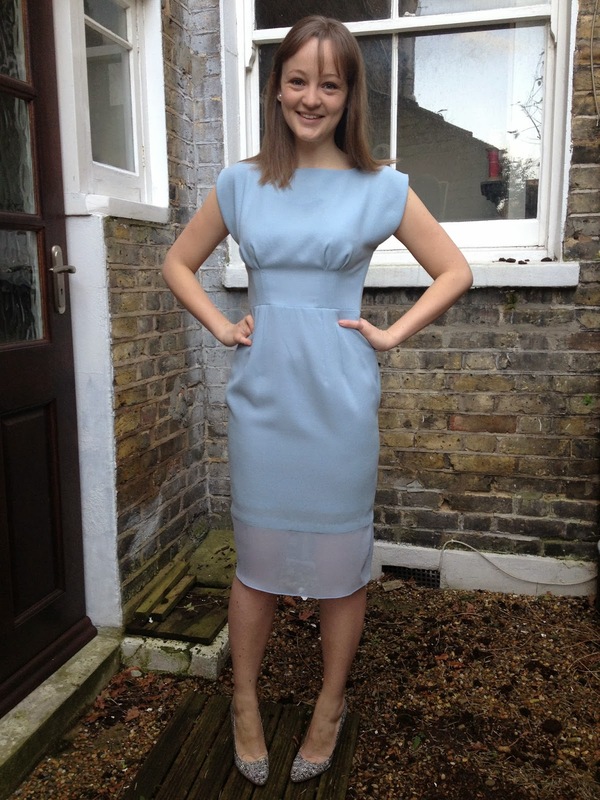 The main body of the dress is wool crepe which is one of my all time favourite fabrics; it looks lovely, wears beautifully and is just scrummy to work with. 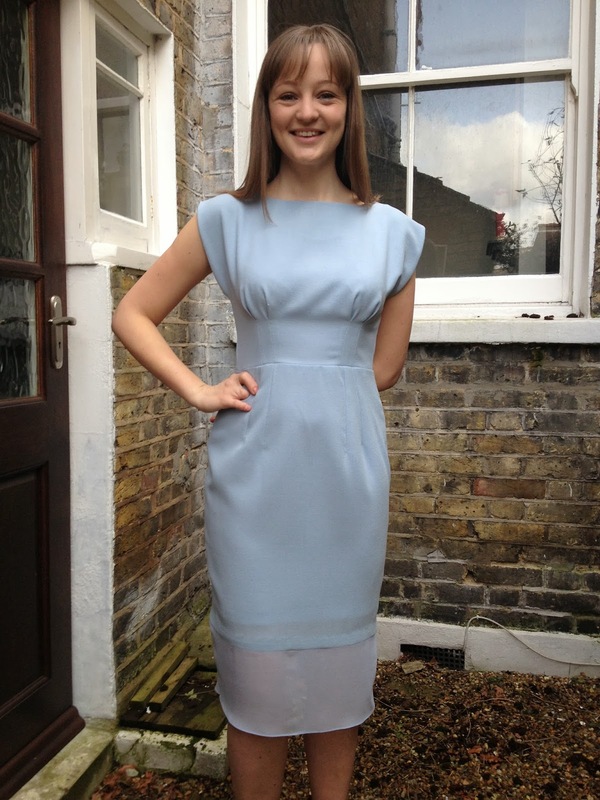 I saw this powder blue wool crepe on the Mood Fabrics website and was sold. Who can resist wool crepe in such a delicious colour?! Apparently not many people as it’s now sold out (!) but this ivory Italian crepe is very similar. There’s quite a lot of discussion on the internet about how to pretreat wool crepe. The most preferred method involves chucking it in the dryer with wet towels and while the speed and ease of this really appeals I don’t have a dryer so instead I steamed it like crazy with my iron. I’m not too worried about further shrinkage as it’s a special dress and with that silk chiffon hem it’ll be going to the dry cleaners anyway. The crepe was perfect for this style of dress; nice and soft to suit those lovely bust pleats but with a good amount of body for the shape of the skirt. I love how my hand stitches sank pretty much invisibly into this stuff too. This particular crepe does need lining as it’s fairly lightweight. I went all out and used this china silk for the lining which feels so great, I’ll be using it in every special dress I make from now on. I drafted a full lining in a style which has intrigued me for a while, using all-in-one facings of the wool crepe and the china silk beneath that. It’s a bit of extra work but I am absolutely in love with the look of this inside and also how it eliminates the risk of lining peeking out of the neckline or sleeves. I carefully clipped and under-stitched the neckline to prevent the facings from rolling out and am really pleased with the nice clean finish. 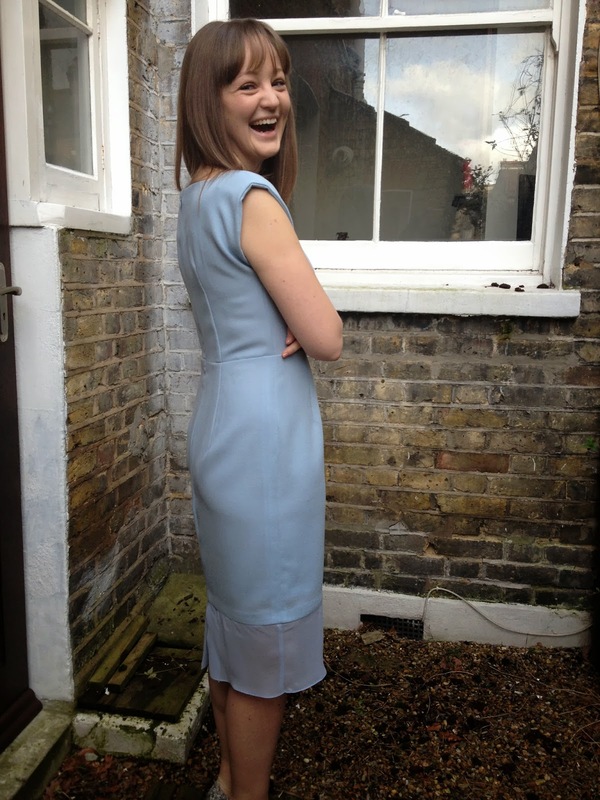 I used the bodice of By Hand London’s Anna Dress combined with their Charlotte skirt and (unsurprisingly as my love for both patterns is hardly hidden!) I totally recommend that little mash up! I made a fair few modifications to get the look that I wanted, including moving the skirt darts to match up with the darts and pleats of the bodice, taking some width out of the neckline and decreasing the length of the shoulder seams (in a fabric with this much body those kimono sleeves were making me look a little like an extra from Star Trek!) I’ll go into more details about these adjustments over on my blog tomorrow to save this from turning into the longest MSN post of all time but I’ll be back here in two months with my next project!